Margarita Salas gave a very sincere speech, talking about her scientific trajectory and her discoveries, always emphasizing that she never worked alone, always with her group colleagues, and her "masters", Alberto Sols, her PhD supervisor, Severo Ochoa, her mentor and postdoc supervisor, and Eladio Viñuela, her husband, life and lab companion. In order to encourage scientific vocations to the young students, some of the ICMAB members, created in 2017 the theatre play "Madame Châtelet and her Instagram followers", which has been already represented in many primary and secondary schools. The play introduces 11 women of the history of science, their life and achievements, in a chronological order. The first one shown is Hypatia of Alexandria, and the last one, Margarita Salas. This is why the "Châtelet team" as we call it, was so happy to meet Margarita. She is certainly an inspiration for many women scientists, a symbol of a strong women, devoted to science, and apart from being a great researcher, with a high number of publicatins and awards, she has always defended the rights of the researchers, especially the young ones. 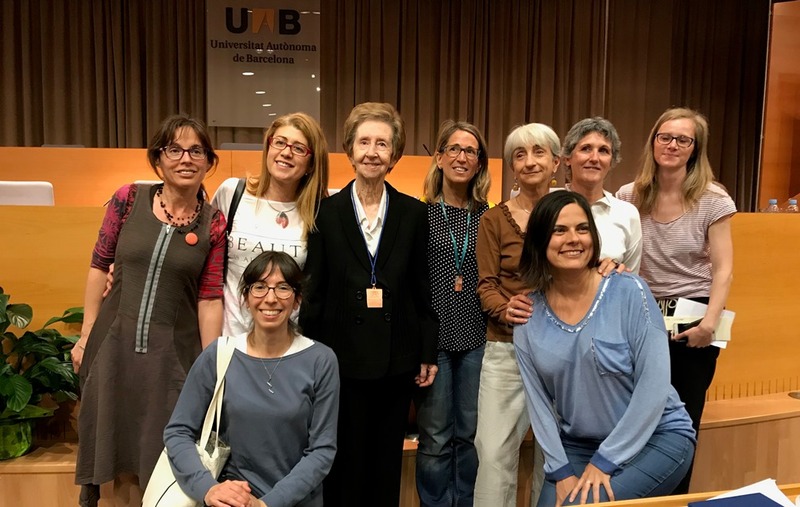 During these last years, she has asked for better funding for Spanish research, better conditions for the young researchers, and she has clearly been a role model for women in science and research integrity. Lectura teatralizada dirigida a estudiantes de primaria y secundaria.Fecha: 6 y 7 de Febrero. Lugar: Salón de actos, IES Pere Calders, Bellaterra, Barcelona.Organiza: Grupo de Mujeres del ICMAB.